The Smith Mountain Striper Club would like to welcome you to our home on the World Wide Web! It is our goal with this web-site to provide timely and useful information regarding the Club as well as the striped bass fishery on Smith Mountain Lake for both our existing and prospective members as well as the general public. You will find some sections here which require a password - these sections are for Club members only - we'd welcome to have you as a part of the Club and gain access to this content. However, we still want to make other useful information about Striper fishing and the stewardship of our fishery available to the general public so look for lots of other useful material here as well. Should you encounter any issues with the site (broken links, etc), or if you have any suggestions on how we can make the site a better place for striper anglers, please drop us a note via the Contact Us page. The Smith Mountain Striper Club is hosting the first annual "Perch Jerk" competition on Smith Mountain Lake as a summer-long competition OPEN TO THE PUBLIC. The goal of this fishing competition is to help educate anglers on the issues involved with summer-time release mortality of striped bass and to highlight other fishing options that exist during the warm-water season. The 2018 SMSC Perch Jerk runs from June 1 through September 15 and culminates in a end-of-tournament white-perch fish fry at which $1000 in cash and other prizes will be awarded to participants. For every 10 white perch submitted, an angler will receive one entry into the cash drawing for ten, $100 prizes. Anglers are to turn in their catch to an identified Club member at one of multiple drop-off locations, who will record the number of fish and then clean and freeze the perch for the end-of-tournament fish fry. All participants will be invited to the fish fry, though they do not have to be present to win the cash awards. During warm-water months - namely mid-June - late September - the water temperatures are such that striped bass have a significantly increased mortality when released after being caught. While the SMSC strongly encourages release of our larger striped bass much of the year, in the summer months when mortality rates increase the Club has adopted a "Catch 2 & Quit" policy on striped bass during the summer months for those pursuing striped bass, and is encouraging the angling public to support this initiative as well. For those that wish to continue their fishing time on the water, white perch provide a great alternative to pursue. When using light tackle, white perch can put up a fun fight, and can be caught on small jigs, simple "fish finder" rigs tipped with live earthworms, cut alewife or shad fished on the bottom or other techniques. As these fish often school up in large numbers, it is not uncommon to catch many of these in an outing - creating a fun experience for young anglers. • To encourage fishing for species other than stripers during the summer months when catching stripers results in a high mortality rate for these fish. • To encourage getting our youth involved in fishing. Perch jerking is fun! 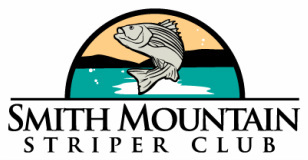 • To publicize and encourage participation in and growth of Smith Mountain Striper Club. • Anyone! Children can fish (encouraged) but to submit fish you must be at least 18 yrs. of age. • Entry fee $0 – For every 10 white perch submitted during the tournament dates, you will receive 1 drawing ticket. -- A club member will meet you at the location, verify the catch, record your name, telephone number, email address, the date and the number of fish submitted. -- The club member may reject any catch deemed suspect to freshness and/or mishandling. -- The club member will transfer the catch to his/her cooler, then fillet and freeze the catch within 10 hours. -- Drawing tickets will be issued on the day of the fish fry. You will receive 1 drawing ticket for every 10 fish submitted. You do not need to be present to receive your tickets, to be entered into the drawing or to win. -- Fish will not be accepted before or after the tournament dates. • Smith Mountain Striper Club (SMSC) will put up $1,000 in prize money. • At the fish fry 10 winning tickets will be drawn from the pool of tickets issued for the fish submissions. • Only 1 winning ticket per individual will be awarded. Each of the winning tickets (10) will receive a $100 cash prize. How does the Fish Fry Work? • Who can come? Anyone! • Date, Time and Location to be determined, but is anticipated to be on a Friday evening or Saturday afternoon in late September or early October. • Fish fry and drawing will be held rain or shine. • Fish (the white perch caught and submitted during the tournament) will be fried up and served with all the fixins by SMSC members. • For those individuals that submitted fish, there is no charge. • For non-contributors of fish, the fish fry cost will be $7 per person payable at the Fish Fry. Children under 12 are free. • If you are planning on attending the Fish Fry, you must RSVP to: smithmountainstriperclub@smsc.com, via mail to SMSC PO box 305 Moneta, VA 24121 or call Rick at 540 204-1554 or 540 774-0328. • There will be free “door-prize” drawings and a 50/50 raffle. Note: If you cannot reach the primary number below for your location, please leave a message and call any of the other three numbers.